The International Horror Hotel announced its official awards list and film selections for the 4th edition of the festival. 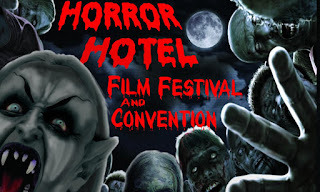 Horror Hotel is a yearly celebration of the best independent horror and science fiction films from around the world, uniting film fans, filmmakers and industry professionals who share a love of the genre. This year's festival will highlight 17 feature films and 62 short films from around the world. The films featured in the lineup represent 15 states and 15 foreign countries. These will screen in two screening rooms over a period of three days, June 5th-7th. The festival also features two days of film lectures and panel discussions, a convention, special effects makeup competitions, scream queen competition, networking parties and more.